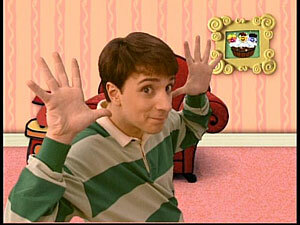 It's such a good feeling: Life should be more like Blue's Clues. mail time Mail Time MAIL TIME MAIL TIME MA-IL TIME! You know, it's easy for Steve to sing about getting mail. Cause he gets it every day. Every single day. Does he know what it's like to check the mail every day and never get anything? I don't think so. In other news, my collection currently includes 25 missionary letters from 12 different missionaries. Sooo true!! Life SHOULD be more like Blues Clues! Then, not only would we get mail everyday, but we would also be able to figure everything out in 3 easy clues. AND, wasn't it so sad when Steve went to college and Joe took his place on the show?